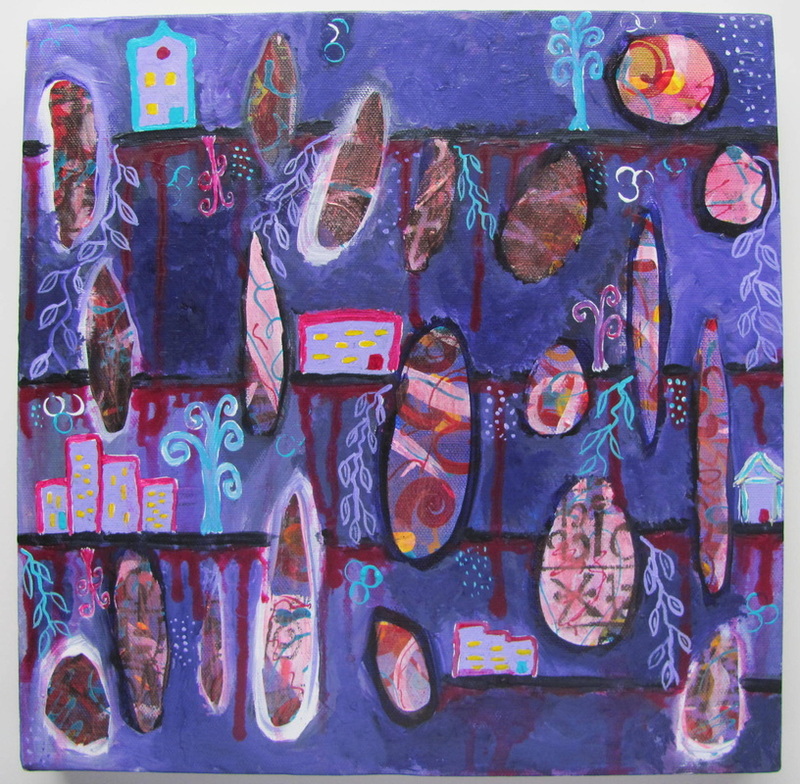 These mixed media and acrylic paintings are available now. Scroll down for more pictures and details. Tribute honors those who have gone before us. She is contemplating all the lives that have touched hers over the years. 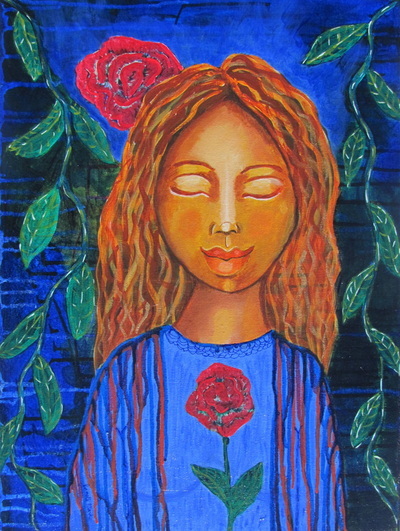 She is holding a rose to symbolize the beauty of life. 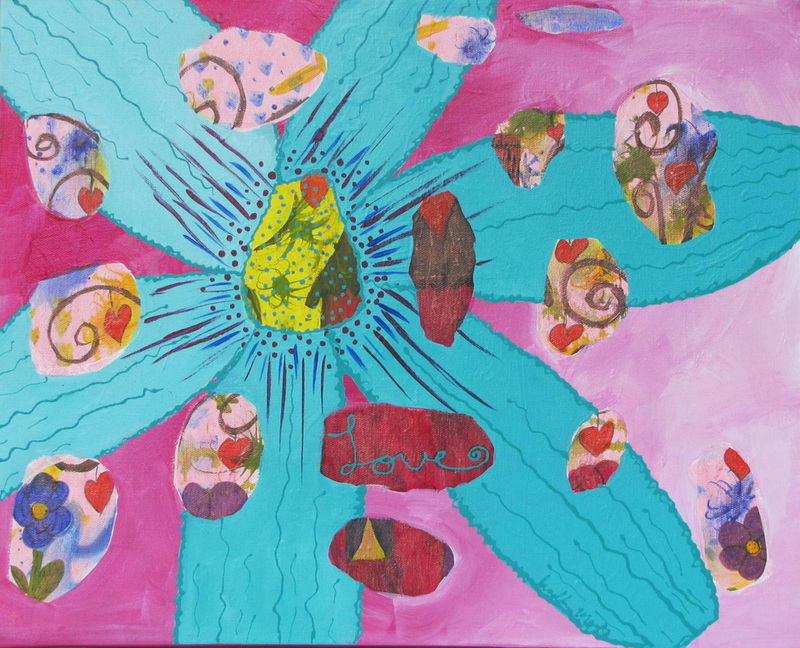 This acrylic painting is on a deep canvas with painted sides and is ready to hang. It is 18" x 24" and is $210.00. These three pieces have a base of duck cloth covered with plaster. I imprinted leaves, lace, string, joint tape, and all kinds of other things into it and then painted and collaged on top. 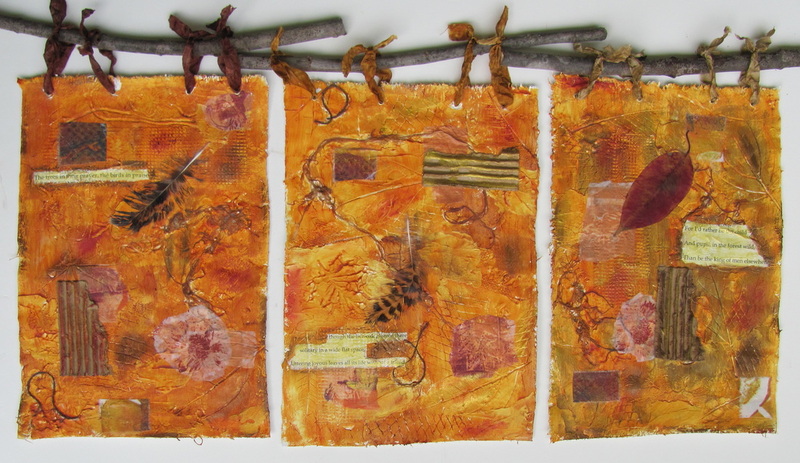 Here is my blog post explaining my process for these three pieces. 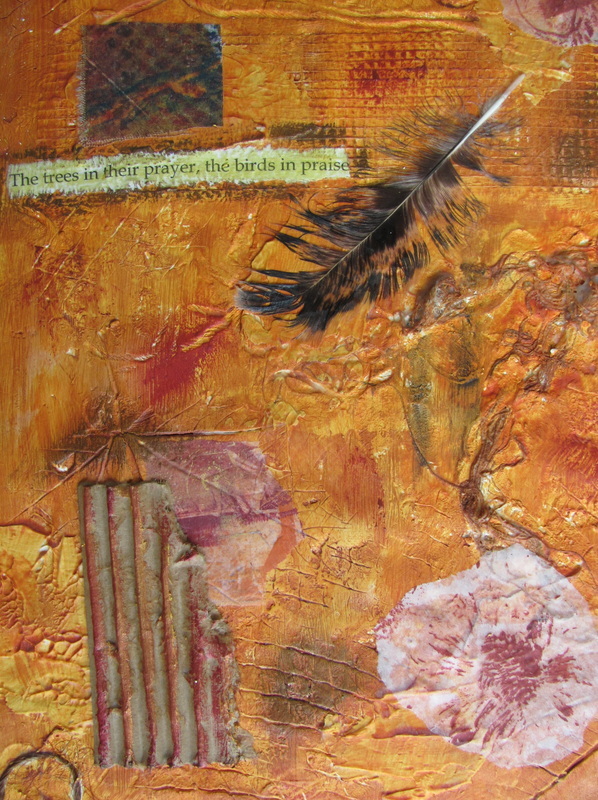 The feathers and leaves are found objects and the fabric and papers that I used for collage were pieces of mono-prints. I used bits of poems that I loved and fit the nature theme. These pieces are individually $75.00 each, but you can buy all three for $150.00. This piece has a base of duck cloth covered with plaster. 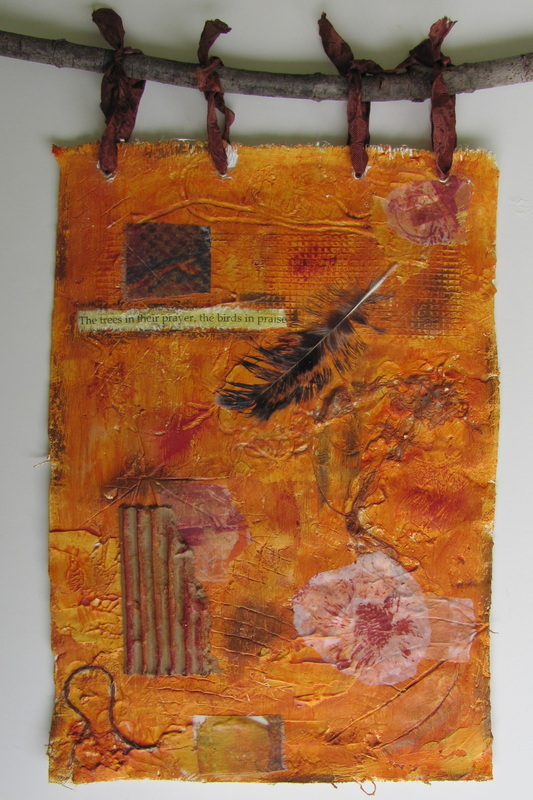 I imprinted leaves, lace, string, joint tape, and all kinds of other things into it and then painted and collaged on top. Here is my blog post explaining my process. The feather is a found object and the fabric and papers that I used for collage were pieces of mono-prints. I used a bit of a poem that I loved that fit the nature theme. 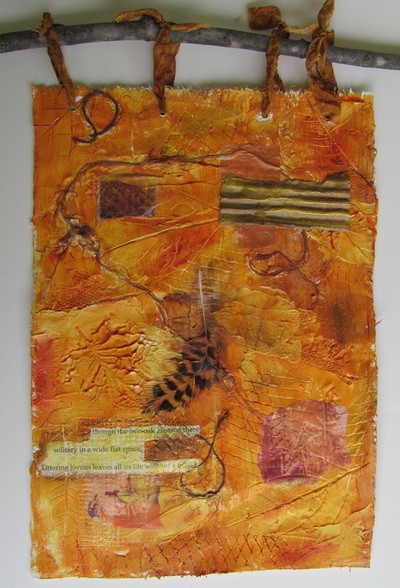 This piece is 8 1/4" x 11 1/2" and is $75.00. This piece has a base of duck cloth covered with plaster. 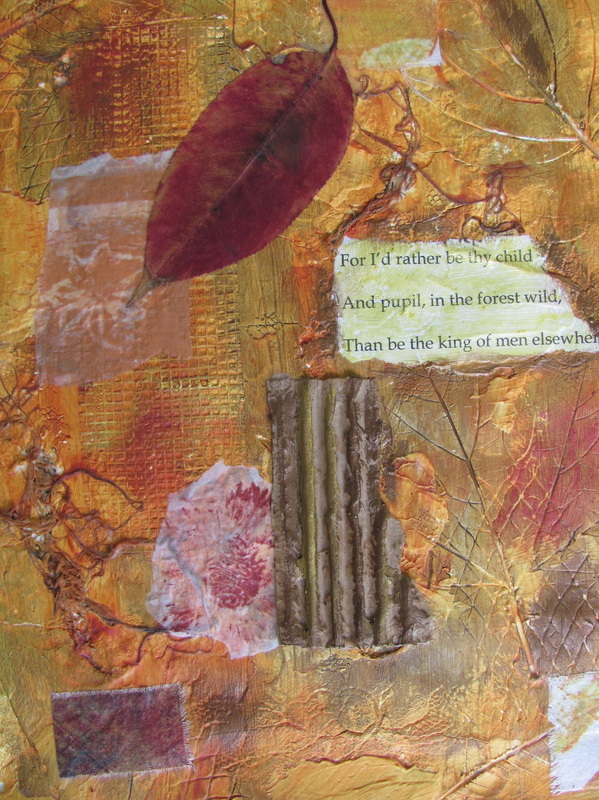 I imprinted leaves, lace, string, joint tape, and all kinds of other things into it and then painted and collaged on top. Here is my blog post explaining my process. 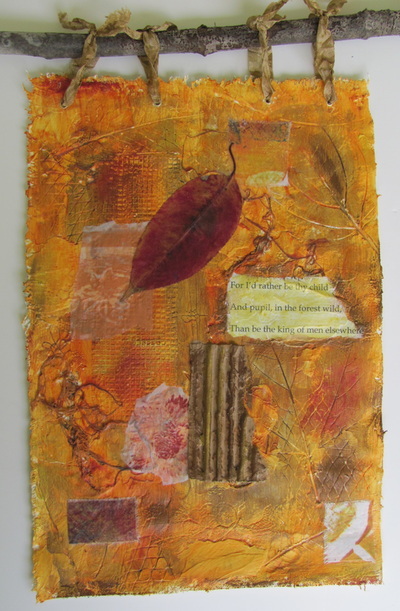 The leaf is a found object and the fabric and papers that I used for collage were pieces of mono-prints. I used a bit of a poem that I loved that fit the nature theme. 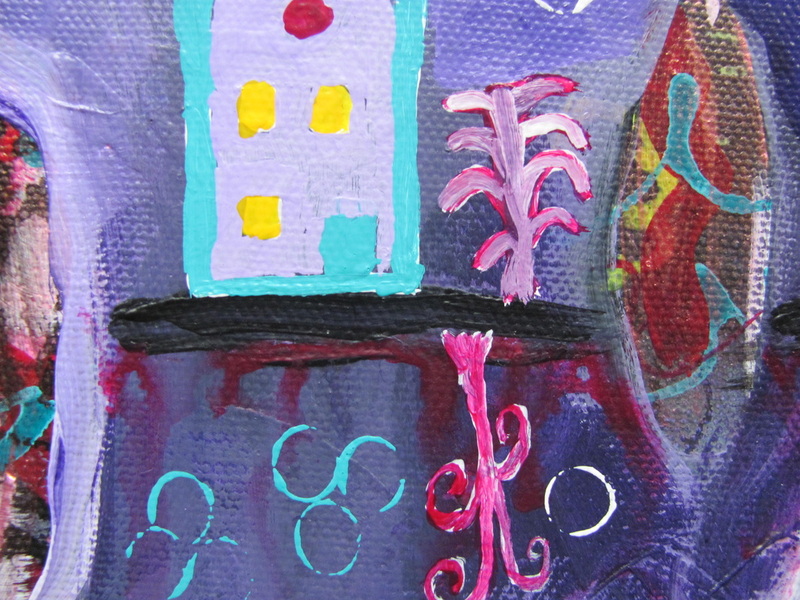 This piece is 8" x 11 1/2" and is $75.00. Just like flowers add beauty to our environment, so too does love add beauty to our souls. The bright summery colors will cheer any room up. 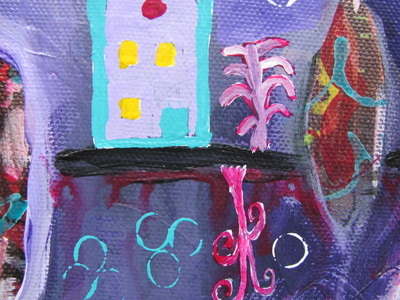 Flourish is filled with symbols and whimsy that peek through the windows into the background. I hope that you have fun exploring the the hidden images and defining the symbols for your own life. 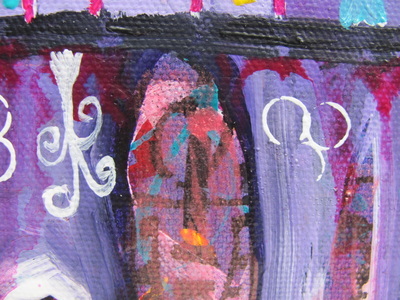 The sides of the deep canvas are painted the same magenta color and it is ready to hang. This is a mixed media painting that is "16 x 20" and $180.00. ﻿This painting has many layers. I love the whimsical abstract style of this painting. I enjoy wild views where vines and flowers cover the landscape. 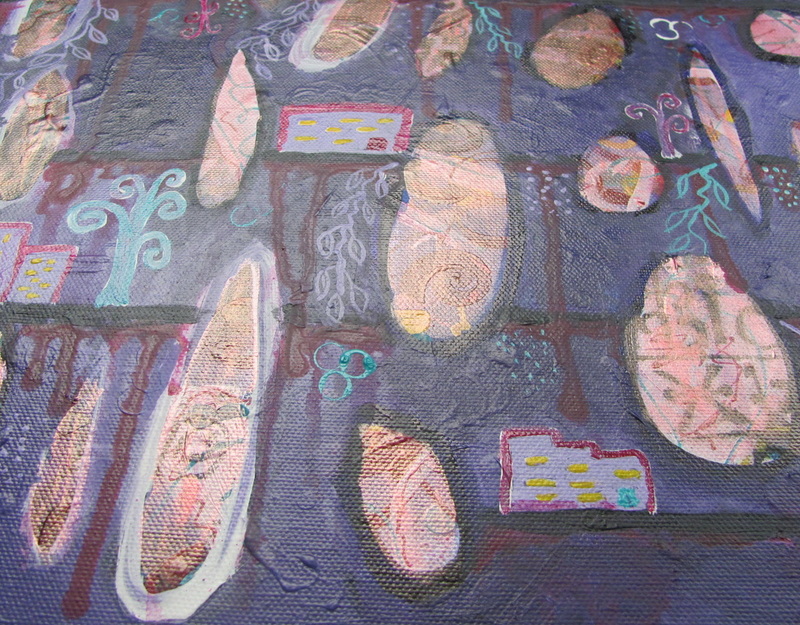 I wanted this painting to have the feel of a wild living landscape, with a touch of whimsy too. Hanging vines and curly trees make my child side happy. I hope that you like them as well. 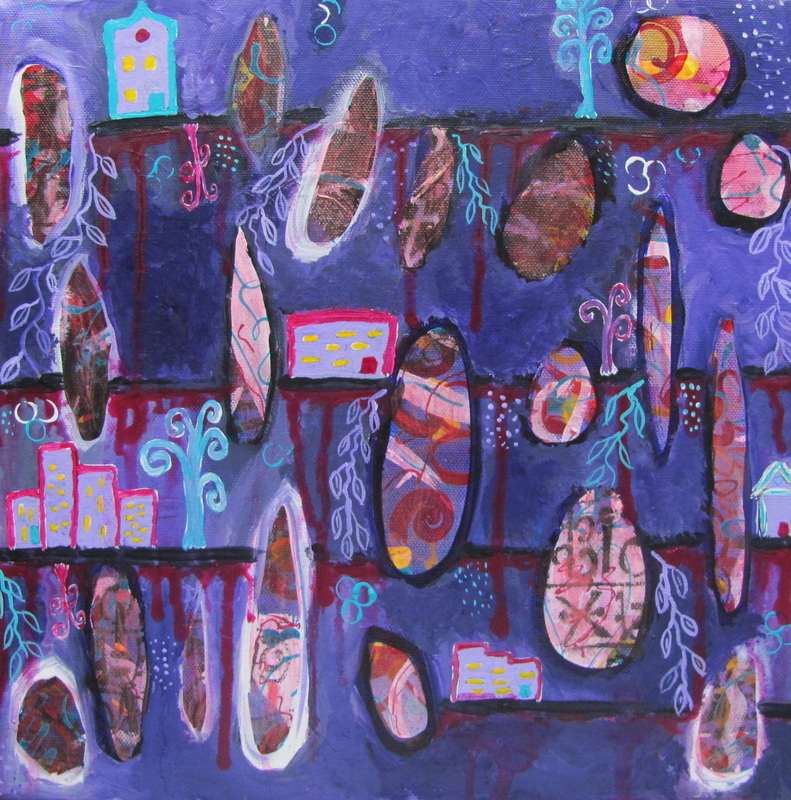 I wanted a touch of mystery and sharing symbols and colors that speak to me. I showed portions of these through the windows into the background. The windows are glazed with Silk acrylic glazes which gives the windows a nice shimmer. When life gets rough and sends icy stormy seas your way, just float on top and stay calm. 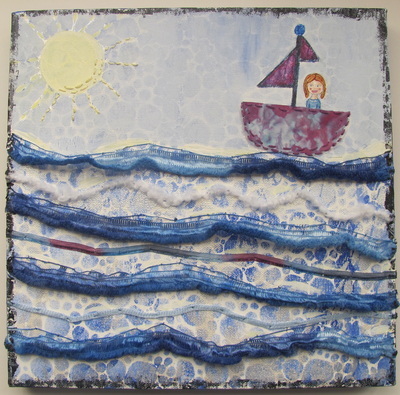 This mixed media painting will remind you to stay above the waves and keep on floating. It is a combined painting and textile canvas. There is a lot of texture and shimmer that adds to the beauty. I use a variety of fibers and hand dyed fabric with high quality artist paints, on this canvas. I added hand stitching so it has that extra special touch. The stitches are sealed on the back, so that they won't come undone or get snagged. I used heavy duty gallery wrapped canvas. The sides are painted as well, so it is ready to hang with no frame needed. 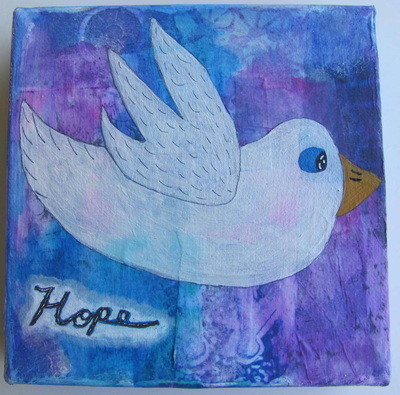 It is 12" x 12" and $120.00. 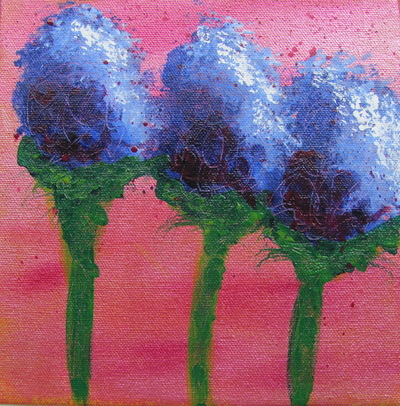 These blue flowers on a shimmery pink background will be sure to brighten up any room. This is an 8" x 8" painting on a gallery wrapped heavy canvas. 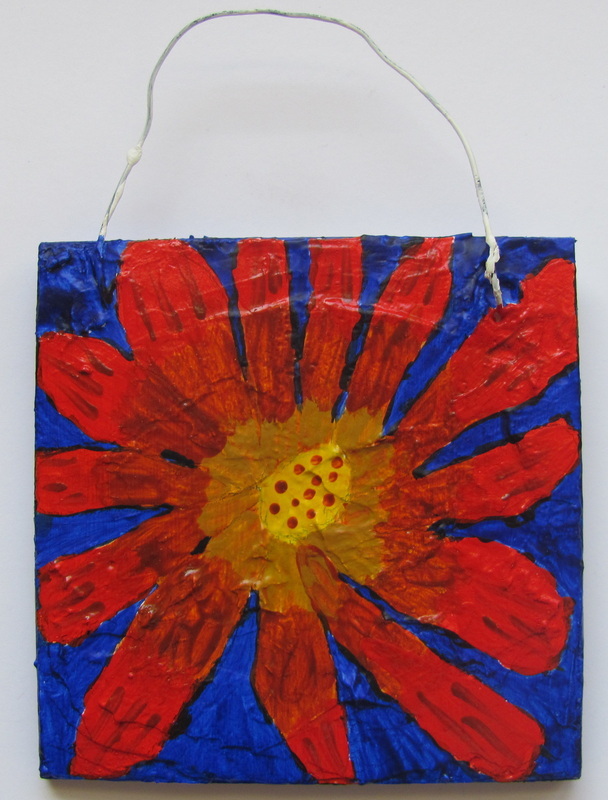 The edges are painted and it is ready to hang from a wire. It is $80.00. This little bird wants to help you feel hope when you need it the most. She has a shimmer that will bring beauty to your surroundings. 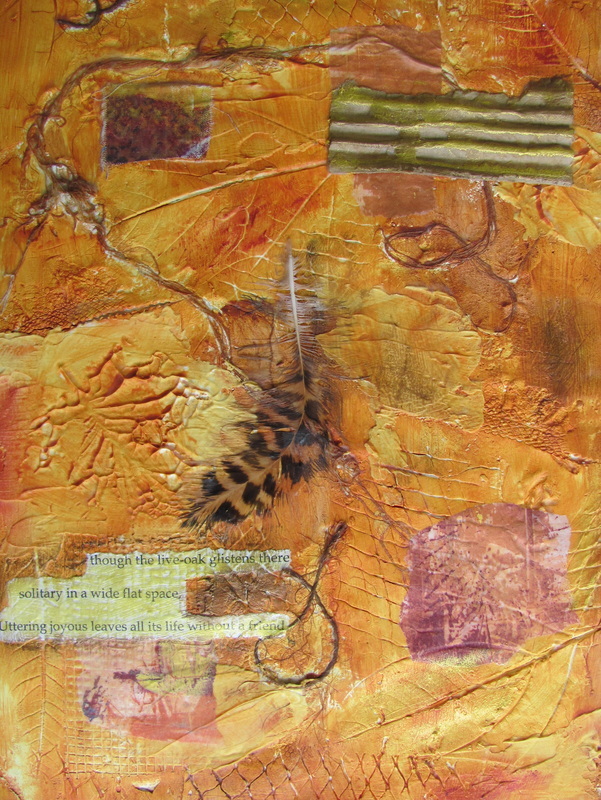 This painting has a base of my handmade collage papers. The edges are finished with papers and paint. It is ready to hang as is, no frame is necessary It is a gallery wrapped deep canvas. It is 6” x 6”. This painting is $60.00. I was inspired by the flowers in my garden for this painting. It is on a wood panel that was covered in plaster. It was sealed and painted with high quality artist paints. It is 3" x 3". It is ready to hang with a wire hanger. This painting is $15.00.